This week in Boomtown Diaries, I’m turning my focus away from the oil field, from teaching, from farming, from life in western North Dakota and am writing a few words instead regarding a very special lady. This Saturday, March 2, this very special lady turns 81. She is my Grandma Marilyn: Grandma extraordinaire, baker of beautiful cakes, sewer of baby blankets, coupon saver, North Dakota farm wife, and defender and protector of grandkids. When I was in 6th grade, she and my Grandpa Wayne retired from farming and moved to Bismarck permanently to be closer to their eight grandkids. It was a dream come true. Now my ideal grandma lived right across the cemetery from us, only a bike ride away. My parents made me mad? I would go to Grandma’s. I was craving homemade cake frosting? I would go to Grandma’s. I was home sick from school? Those were the best days! I would go to Grandma’s, and she would lavish me with attention, love, and cups of Sprite while we watched Price is Right together. I admit, I may have faked illness a time or two. Before I knew Grandma Marilyn as my grandma, she was a fiery North Dakota farm wife for much of her life. She grew up in the Great Depression, was Valedictorian of her class in the small town of Michigan, received a teaching certificate from Mayville State, and taught in a one-room prairie schoolhouse before marrying my Grandpa Wayne. They had been in high school together but didn’t become a couple until after she scared off a pretty blonde he was with at a dance. Well, my grandpa says she was pretty. My grandma says she wasn’t. They lived on an Army base in Utah for a while and then in an apartment over a shop in town while my grandpa drove a truck for Sweetheart Bread, worked as a farm hand, and finally, purchased his own farm outside of Michigan when my mother was little. Although they don’t farm anymore, my grandparents are true North Dakota pioneers. They have strong Norwegian roots, a rich history of scratching out a living from the eastern North Dakota soil, and some pretty entertaining stories of my grandma working as my grandpa’s farm hand, usually as a grain truck driver. My grandma also makes some mean lefse and krumkake in case you were wondering. She makes mean lots of things, actually. One mystery I’ve never figured out is why her smushed-up eggs taste so much better than mine do, and even her toast. What the heck? 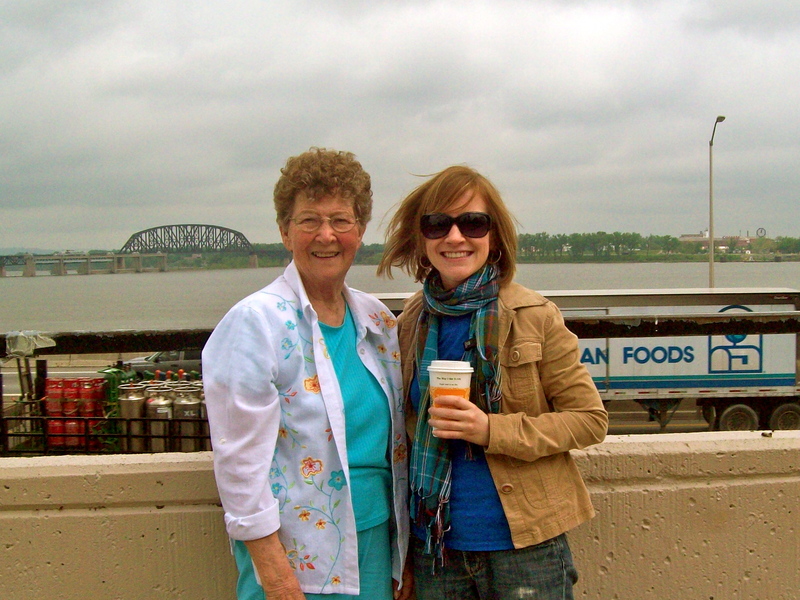 I could never fit enough stories into one blog post to describe my Grandma Marilyn. It would take a whole book. Fast forward to her 81st year, and you have one award-winning grandma. At least, if there were Grandma Awards, she would get one. She shows up to everything even remotely involving her grandkids. 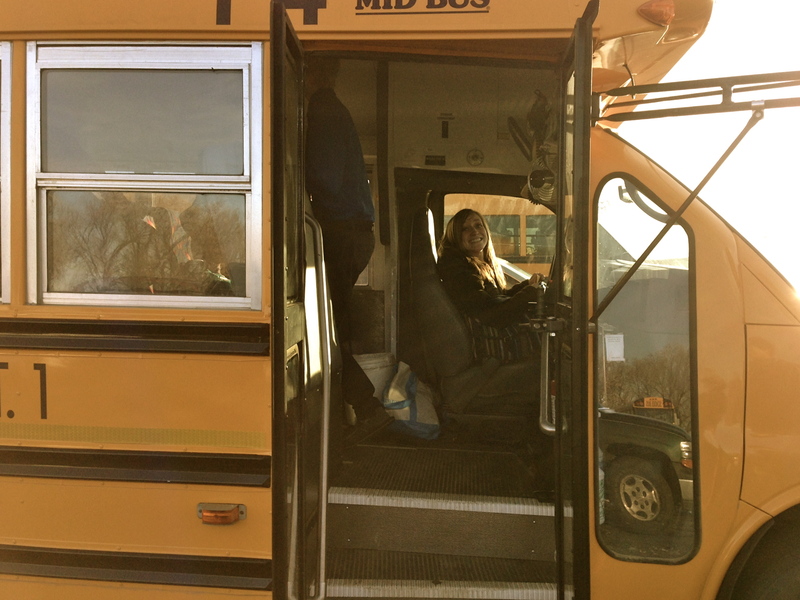 She would show up at my high school and college cross country meets where it was sleeting so hard it was blowing sideways, just to watch a race that lasted for less than 20 minutes. In fact, she has shown up at every track meet, baseball game, basketball game, football game, soccer game (you get the picture) plus every piano recital, spelling bee and music festival in which my brothers, cousins and I have performed. On weeks of regional basketball tournaments, she usually doesn’t sleep. She is either too nervous thinking about the game the next day, or too excited thinking about the game the night before. Last fall, she and my grandpa showed up at a crowded bar to watch Danny and I play a Halloween show with our bluegrass band The Dwaylors. She chose a seat at a small table on the edge of the dance floor. When a tall young man dressed as a cowboy got in her way, she tapped him neatly on the shoulder and politely demanded that he move out of the way so she could see her grandkids. He moved. The best part was, within a few minutes, he became her personal bouncer and was clearing out all the other costume-wearing Halloween revelers who blocked her view of the stage. Grandma at the Halloween show. 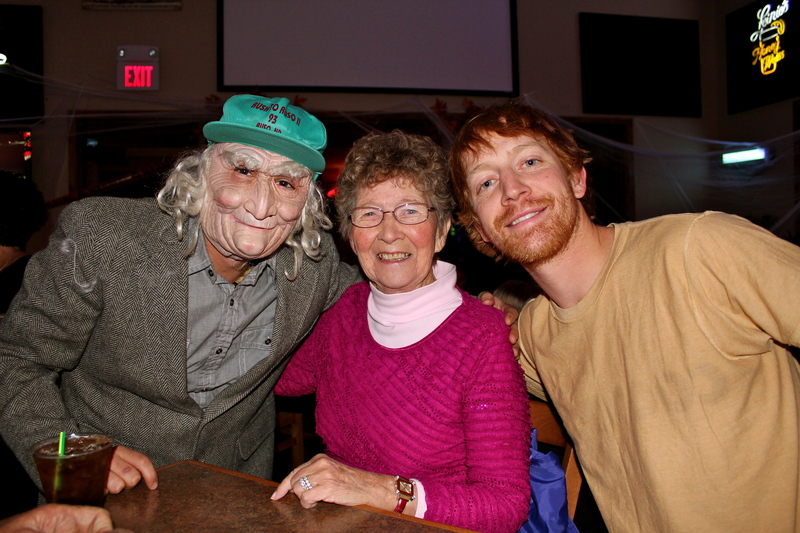 That is actually not a creepy old man on the left – it is our cousin Adam in a mask! Grandma Marilyn is more than just our #1 Fan. Anytime my brothers, cousins or I need someone to have our backs, we have Grandma. If a ref calls a foul against one of my brothers, he is crooked. If a boyfriend or girlfriend breaks one of our hearts, he or she has no brains. If we aren’t named Valedictorians, the books are probably rigged. But who doesn’t need at least one never-wavering supporter in life? Shouldn’t we all have someone who knows we can do no wrong, who has our backs no matter what and is always smiling and holding a plate of cookies? 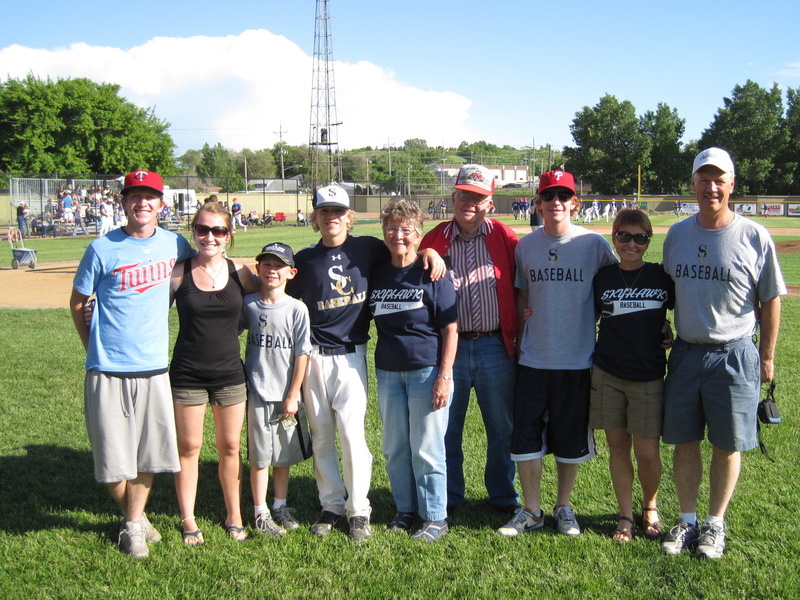 I know that the eight of us grandkids would consider ourselves the luckiest grandkids alive. In her 81st year, I hope this very special lady, North Dakota pioneer and Grandma Extraordinaire, finds just a piece of the love and happiness that she has given all of us. And since she has, true to form, become the most devoted reader of Boomtown Diaries since blog post #1, I know she is reading this on her basement computer. So I love you, Grandma! Happy birthday week!